Built for big rides and long days in the saddle, the Synapse offers full race performance, allday geometry, wide-ranging capabilities and a micro-suspension system that insulates you from the bumps without isolating you from the experience. It’s a true endurance machine, for true endurance riders. Blisteringly fast, all-day comfortable, all-road capable and engaging to ride, the Synapse is the best all-round road bike we’ve ever made. Frame weighs just 950g with a level of stiffness normally reserved for World Tour sprinters’ rigs. This thing is fast. SAVE Micro-Suspension in the frame, fork and seatpost keeps you protected from shocks and vibration yet connected to the feel of the ride. The rider position perfectly balances low, forward efficiency and upright comfort, for a “just-right” feel that encourages full-gas exploits and all-day sessions. Proportional Response Design ensures that every rider, regardless of size, enjoys the same ride feel and handling. Each size gets its own custom carbon layup, tube dimensions and geometry. We even use three different steerer diameters and fork rakes through the size run for a truly tailored feel. With full clearance for tyres up to a whopping 32mm wide, and subtle, hidden mudguard mounts, the Synapse is ready and willing to explore the wilder side of endurance riding. Frame: Synapse Disc Asymmetric, BallisTec Carbon, Di2 ready, SAVE, BB30a, flat mount, 12mm thru axle. 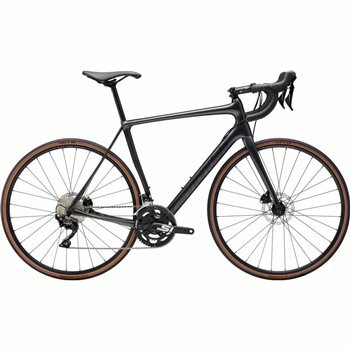 Fork: Synapse Disc Asymmetric, BallisTec Carbon, SAVE, integrated crown race, 12x100mm thru-axle, size-specific design - 44-48: 1 1/8" steerer, 60mm rake 51-54: 1-1/8" - 1-1/4" tapered steerer, 55mm rake 56-61: 1-1/8" - 1-3/8" tapered steerer, 45mm rake. Rims: WTB STP i19 TCS, 28h, tubeless ready. Hubs: Formula RX-512 12x100 front, RX-142 12x142 rear. Tires: WTB Exposure TCS, 700 x 30c, tubeless ready. Crank: Cannondale Si, BB30a w/ FSA rings, 50/34. Bottom Bracket: Cannondale Alloy PressFit30. Cassette: Shimano 105, 11-34, 11-speed. Front Derailleur: Shimano 105, braze-on. Rear Derailleur: Shimano 105 GS. Handlebar: Cannondale C3, 6061 Alloy, Compact. Stem: Cannondale C3, 6061 Alloy, 31.8, 7°. Headset: Synapse Si, 25mm Alloy top cap. Brakes: Shimano 105 7070 hydro disc, 160/160mm RT56 rotors. Brake Levers: Shimano 105 7020 hydro disc. Saddle: Fabric Scoop Radius Sport, steel rails. Seatpost: Cannondale C3, 6061 Alloy, 25.4 x 350mm (44-56), 400mm (58-61).